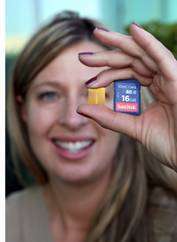 SanDisk announced it has begun production shipments of flash memory cards based on the company's advanced X4 flash memory technology. This innovative new technology holds four bits of data in each memory cell, twice as many as the cells in conventional multi-level cell (MLC) NAND (2-bits-per-cell) memory chips. Based on 43-nanometer (nm) process technology, the 64-gigabit (Gb) NAND flash chip is the highest-density single-die memory device in the world to enter production. SanDisk is shipping 8 gigabyte (GB) and 16GB SDHC cards as well as 8GB and 16GB Memory Stick PRO Duo cards using X4 technology. "The development and commercialization of X4 technology represents an important milestone for the flash storage industry," said Sanjay Mehrotra, president and chief operating officer, SanDisk. "Our challenge with X4 technology was to not only deliver the lower costs inherent to 4-bits-per-cell, but to do so while meeting the reliability and performance requirements of industry standard cards that employ MLC NAND. Our world-class design and engineering team has applied its deep experience with high speed 2 and 3-bits-per-cell flash chip designs and collaborated closely with our leading design partners to develop and perfect new and powerful error correction algorithms to assure reliable operation." SanDisk pioneered the removable flash memory storage industry since the company's inception in 1988. The company continues to lead the industry with advancements in MLC and controller technology with the development of 2-bit, 3-bit and 4-bit-per-cell and 3D technologies. Tel Aviv University (TAU) had provided a significant contribution to the X4 advanced error correcting and digital signal processing technology, which was licensed exclusively to SanDisk by Ramot at Tel Aviv University Ltd., TAU's technology transfer company.